U.S. AIR FORCE CLEARANCE GRANTED! The heroes. Their missions. The specialized training that transforms ordinary men and women into members of the AIR FORCE ELITE. Get ready for the most grueling, ground-shaking combat missions ever revealed in a television series. For the first time, find out what it takes to become a warrior in the military's most elite unit, Air Force Special Operations Command (AFSOC). Each pulse-pounding episode of AIR FORCE ELITE follows a top-secret, life-and-death military operation through the eyes of the men and women who battled the enemy and lived to tell about it. When enemy machine-gun fire is striking close enough to kill you, it takes more than courage to survive - it takes high-tech equipment, weapons with pinpoint accuracy, and the roughest physical and mental training that the human body can endure. 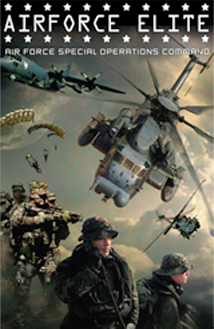 This is real-life international action and adventure, produced with the full cooperation of the U.S. Air Force. Meet the AIR FORCE ELITE.